I always think about things in terms of goals (do more of such-and-such, spend less money on this-or-that). I even do it with my knitting (just look at all my goals posts). While visiting with Christy this weekend, Michelle mentioned all the life lists she’s been reading lately. So it got me to thinking, what about a knitting life list? Here’s mine — a lifetime list of knitting-related things to accomplish. As I created the list I realized it’s a bit different than a traditional life list. Some of my items are reminders of things to do continually, while others are “do this at least once”. I plan to review and revise this list periodically, just like I’ve been approaching my yearly goals. 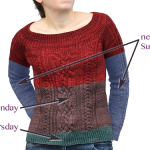 Approach knitting like a hobby and not a project that needs to be managed. In other words, keep it fun. Knit St Brigid or another Starmore aran. Start off each year with less stash than I did the year before. Keep the stash organized and catalogued. Knit what I love, and love what I knit. Don’t forget to let go of the knitting occassionally. A corollary to #1. Knit a colorwork project. I’m not talking a hat here. Something large, but something I’d actually wear. Jade Starmore’s St. Aula (love the hood! ), and Kaffe Fassett’s Brocade from Rowan 38 come to mind. Share the craft with others. This could be through formal teaching, or helping out a friend, or even tutorials here on the blog. Publish some patterns. I realized this year how hard this is while having a job that takes a lot of my focus. But I know if I don’t do this, I’ll regret it. It may not happen for a while, but I don’t want to lose site of the fact that I really want to do this. So what about you? I’m curious to see what others think, so feel free to post this on your blog if you’d like. I think you are doing no.10 right now, you teach through your blog and you help those in need :). And you should definitely go for no. 11-you have the talent :)…go for it. I want to go to camp too–perhaps we should get this organized! What a great idea. You have really given me food for thought for the next little while. A knitting life list… what a great idea. I made knitting new years resolutions this year but I love this life list idea. When you listed keeping knitting fun it really caused me to think. I need to work on that area. Great goals! Thanks for sharing them. great goals! a lot of mine are similar to yours i just don’t write them down. That’s a great list. 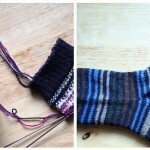 One of my items would be try to go to a knitting retreat or knitting classes every year – not specifically to camp. Hmmm. . . another goal oriented person out there. Great list. Question: When you make goals, does it cease to become a hobby? Wonderful list Jody! I’m gonna give my own some thought! Thanks for sharing this- but what I keep incessantly clicking on your site for is the full on pic of your Rhinebeck sweater! Am I missing it?